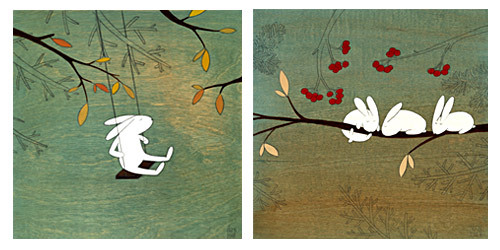 Estonian-American artist Kristiana Pärn has created a series of acrylic and pencil on wood illustrations that have charmed us with a sense of innocence and a fairy tale-like, whimsical atmosphere. In Kristiana's fertile imagination, bunnies exercise and sleep in marshmellow trees, birds knit, foxes skinnidip, and polar bears sommersault. 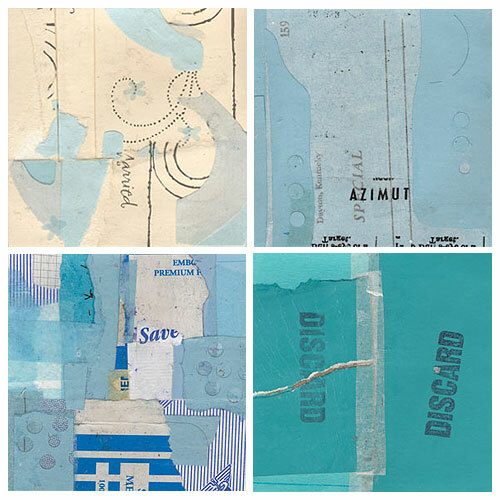 Kristiana launched her art career at young age and studied painting and drawing with Estonian painter Marje Berlokko; she now resides and works in Brooklyn, New York. Besides original paintings, Kristiana’s work is also available in large prints and note cards series. Please visit Kristiana’s Web site and Etsy store to see more. 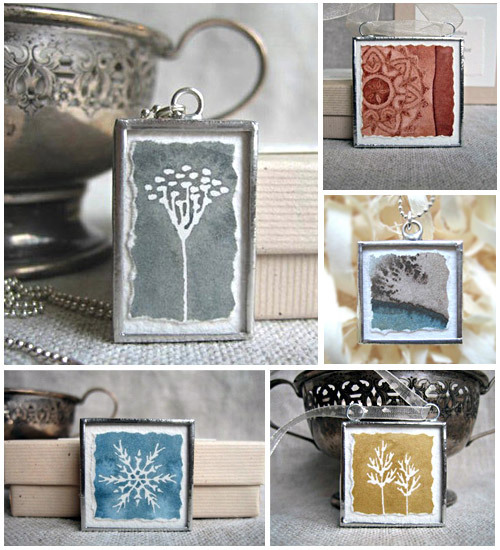 Shown above are mini watercolor paintings framed inside lead free pewter. 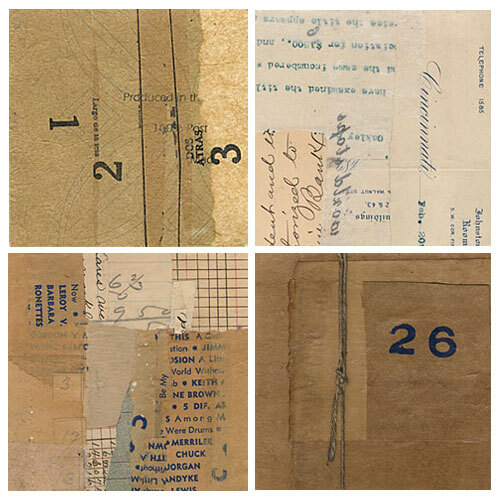 These original pieces are created and painted by Cynthia Calla from Connecticut. 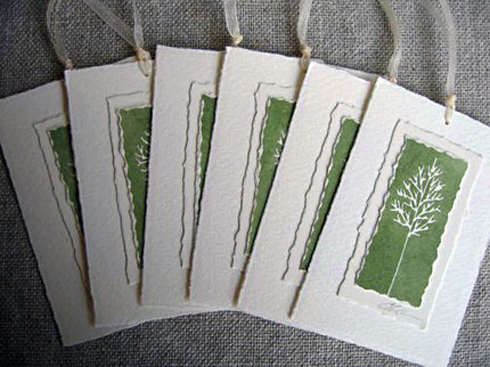 Each painting and design is unique and available in decorative ornaments, pendants, as well as gift tags. Great gift choice for the holidays. Available for purchase at Cynthia’s online store. If you are looking for unique and artistic gifts for the holidays, visit Three Potato Four. Their online store offers many unique items, including home decor, decorative mugs and plates, accessories, art prints, etc. 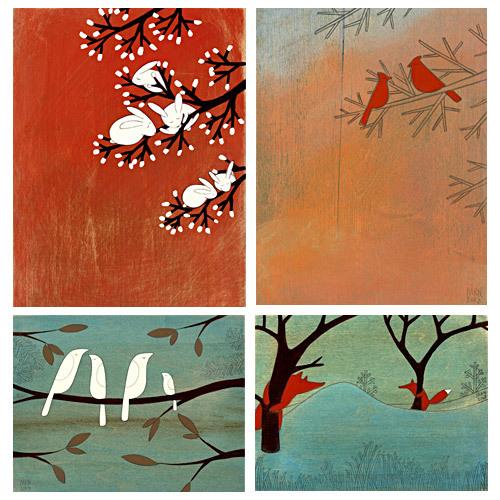 One of the artistic series that attracted our eye is the bird/botanical prints. 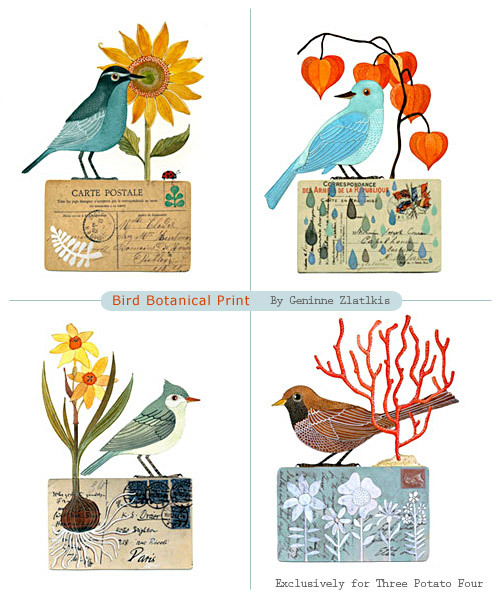 Geninne Zlatlkis has created a series of four prints with a charming mix of birds and botanical imagery. The prints measure 6 x 8 inches, on acid free Fabriano watercolor paper, and are signed and numbered. Made exclusively for the Three Potato Four. As we move into the wet months of the year, we turn to Bill Shelley to appreciate what the water does to the landscape. Here we present two of his newest pieces painted on the spot at Northern California waterways -the Laguna de Santa Rosa and the Tomales Bay estuary near Point Reyes. 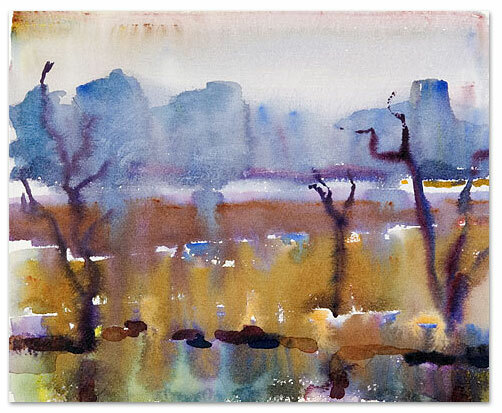 Bill's masterful wet-on-wet technique and color choices perfectly capture late fall in Northern California. 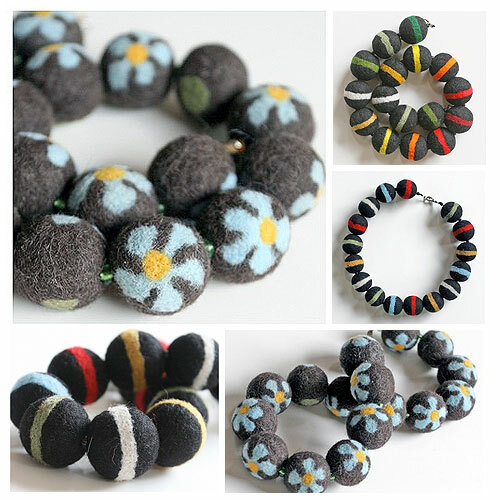 Handmade by Daniela Shelton, these whimsical felted-bead necklaces are made out of wool. Try these out if you fancy tactile, wearable art pieces that feel as luxurious as they look. Daniela and Chris Shelton's eco-friendly, feel-good works are an excellent idea for holiday gifts. Visit their Hasenpfeffer online store. We have previously posted about Randel Plowman's bird collages that immediately caught our eye and have made a lovely addition to our walls. 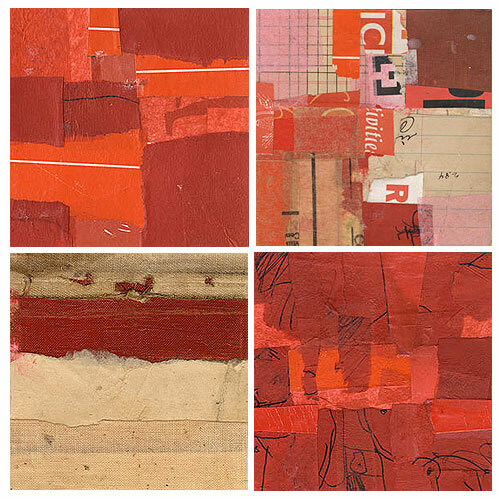 Looking deeper into Randel's work, we gained a new appreciation for his collage skills when viewing the abstract pieces we have collected here. Dispensing with imagery, you can see Randel’s skillful use of restricted color palettes, creating depth and rhythm while exhibiting a marvelous tactile sense. These pieces go well with some improvisational jazz. Visit Randel Plowman’s Web site to see more. 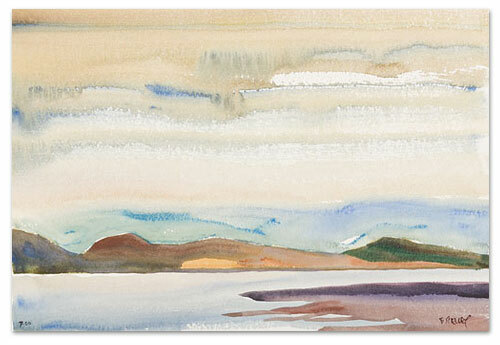 Simplicity in life and art is almost always a good way to go, but can be deceptively challenging to accomplish. 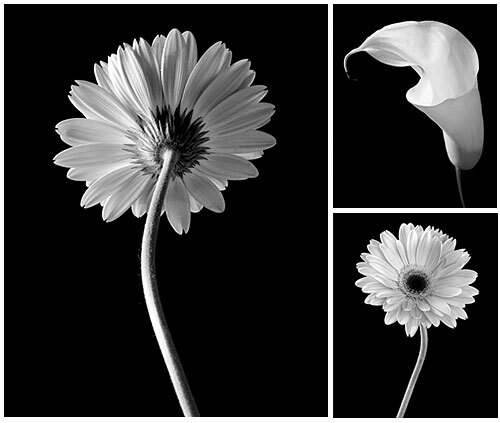 The photos of Jennifer Squires we have collected here speak volumes about the simplistic beauty of flowers, form, light and shadow. 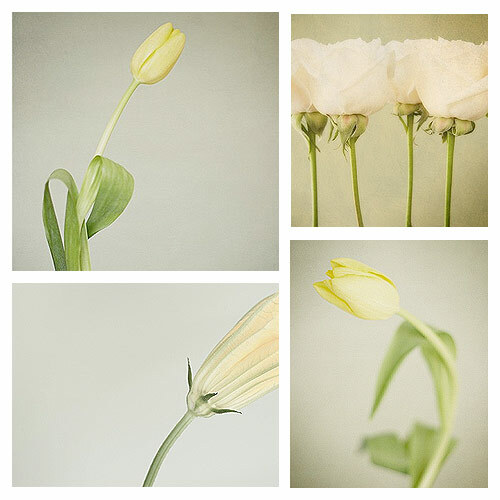 Jennifer, a professional photographer since 1996, has spent her whole life taking pictures. 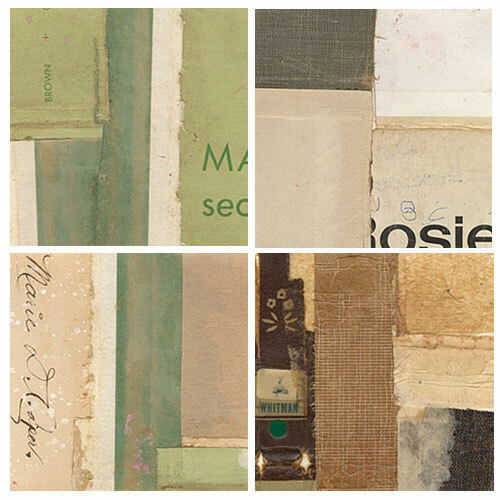 Previously working out of Ontario, Canada, she now pursues freelance work in London, UK. Her photographs are available for purchase through her Etsy store.